For couples who desire a secluded tropical destination wedding, look no further than the Sandos Caracol Eco Resort, tucked deep within rich jungle surroundings. No matter where you have your wedding ceremony at the resort, you will be surrounded by the environment, with rich mangroves and exciting wildlife that includes peacocks and spider monkeys. The cenote is a true wow-factor at the resort, the Mayan word for the resort’s naturally crystal clear swimming hole, where your wedding guests can go snorkeling or relax dockside. The waterpark has slides and sections for kids and adults, and with adults-only areas, there is plenty to do for every member of your wedding group. The resort focuses on preserving and presenting traditional Mayan culture, and you can even utilize tribal drummers and the Tezmecal ceremony for your wedding. At the Sandos Caracol Eco Resort your destination wedding can also interact with Mayan ideologies provided on site through numerous presentations and experiences throughout every week. 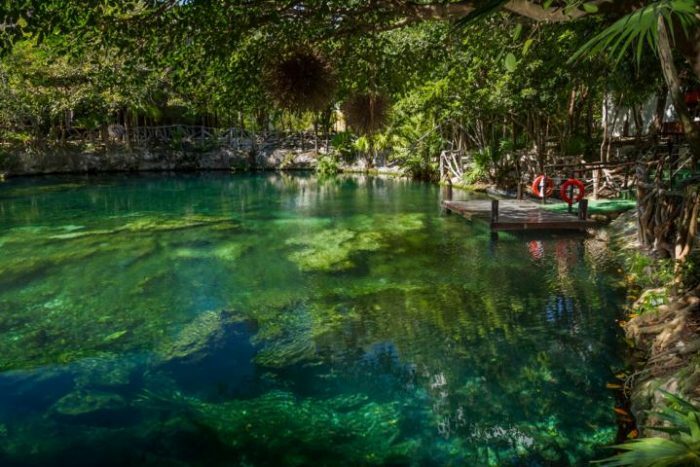 The cenote hosts a celebration every Thursday, retelling a classic Mayan story of a forbidden couple who fall in love, who met at the swimming hole every night in secret. There is even an option for Mayan drummers to be used during your ceremony. Each package welcomes up to 30 guests. 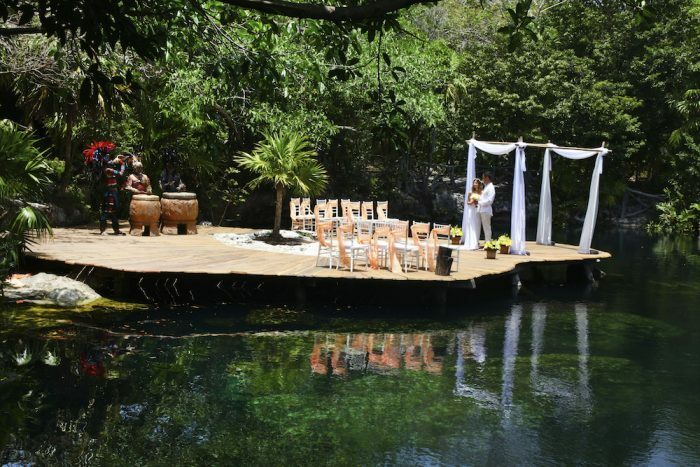 Each package is designed with a different ceremony venue in mind, for example the Green Wedding package utilizes the cenote deck. A la carte weddings and Indian wedding packages are also available. Upgraded packages, additional guests, and add-ons are available for an additional cost. 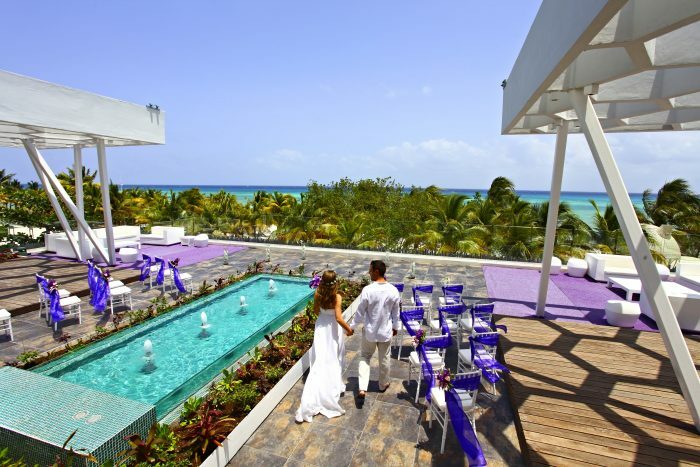 Rooftop Terrace – 100 guests max, Beach Gazebo – 100 guests max, Cenote Deck – 70 guests max. 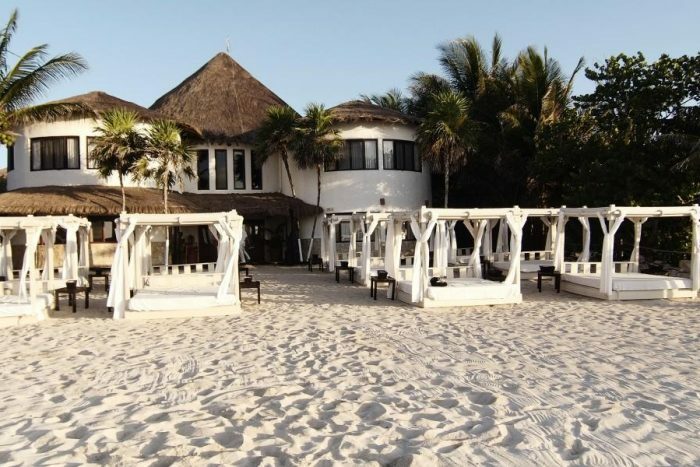 The resort is able to perform between 1 – 3 weddings per day. When more than one wedding is hosted per day they will take place at different times during the day and at different locations in order to guarantee privacy to each wedding. Daily schedule is 11am, 1pm, and 4 – 5pm for sunset. $98 – $125 average price per person per night. Rooms include private balcony or terrace, and children 1 and younger stay free. There are adults-only rooms and sections available at an additional cost, and these areas do not allow anyone under the age of 18. Large/div> There are 956 rooms with garden, pool, or jungle views. The property is very large and recommended for more active guests. There are golf carts available at an additional cost. 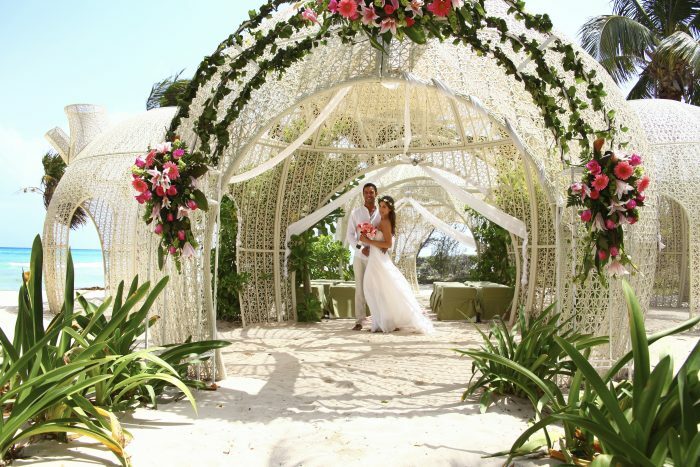 For weddings, the resort’s busiest months are January and April – July. It is recommended couples book at least 10 months in advance if they want a specific date. The resort is located 33 miles from the CUN airport. There are 956 rooms with garden, pool, or jungle views. The property is very large and recommended for more active guests. There are golf carts available at an additional cost. A: Since December 2016, 167 weddings in total. Q: What compliments do the brides typically give the resort? A: Brides comment all the time about the wedding venues being stunning and all the staff do an exceptional job during their weddings regarding the set-up, service and food. A: The natural environment with over 40 eco activities, kids club and waterpark with 29 slides (including 7 for adults) make Sandos Caracol a great resort for families. Adults have the option to book a room in Select Club adults only area which includes an exclusive pool, jacuzzi and beach club house for them to chill. 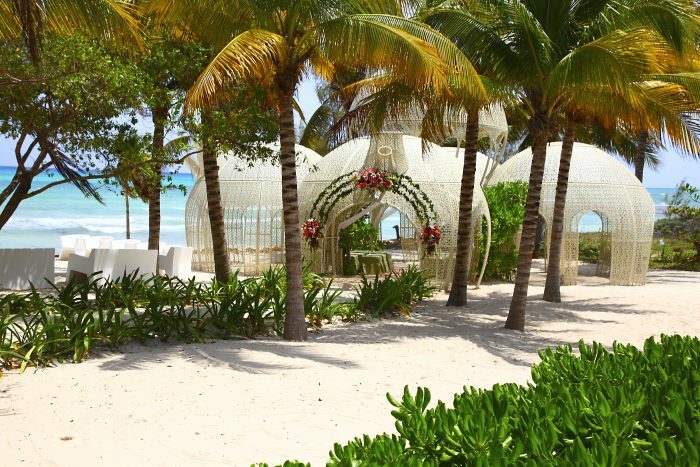 For weddings our unique ceremony locations are very popular: our Cenote (natural lagoon), private rooftop terrace and uniquely designed beach gazebo. A: Privacy is very important, so we only confirm one wedding in each time slot (11am, 1pm and 4/5pm for sunset). With the sunset being the most popular slot we recommend to book the wedding 8-10 months ahead of time. Also, ask your guests to book their room ahead of time as the resort does tend to book up typically 1-2 months out.